I wanted to make a long card this time because I have these nice die cut envelopes that are business sized, but close at the end. All I had to do was put the circles and brads on so that the envie would have a figure eight closure. The card is 4" tall and 9.25" wide on a white base – a nice change of pace. So, for the card I tore three pieces of cardstock and one piece of vellum and staggered them for the card top. For the sentiment I punched a panel of mauve paper with a border punch, topped with a green panel and popped up for a little bit of dimension. 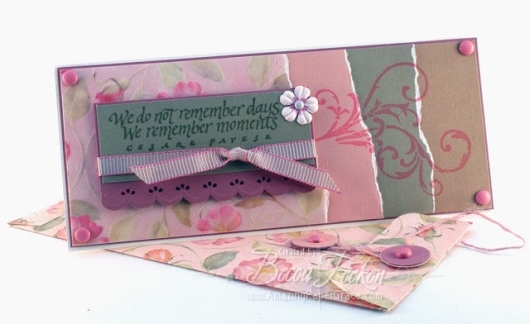 Embellished with ribbon and a prima paper flower. 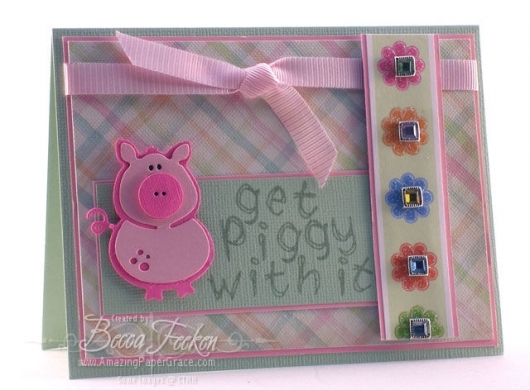 Lastly, stamped a flourish and added four pink brads. I like the long card and the layout u used is nice. just another beautiful card. the saying is one of my favorites. Oh, I have so wanted to do this and now I’m gonna. Several bloggers have made a commitment to offer a card on the 8th of each month that includes a scripture that has special meaning to them. You can read more about the challenge on Lori Craig’s blog here. 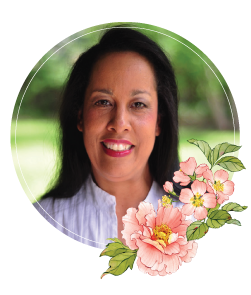 She lists all of the Scripture Chicks and their blogs; their cards are amazing and the stories of their inspiration give glory to God. I’m so delighted to have a card to share today, and I know that this project over the course of the year will move me closer to spiritual goals that I have. I’m starting a little bit late, so I’m behind, but I try to make up both the January and the February cards. I’ve had this stamp in my stash for some time and I always smile when I think of this verse. When I pulled the verse out, I immediately thought of the French Flair background stamp that I had yet to use. The card is very simple, with a gray base card popped up on a dark gray panel and topped with design paper onto which I stamped the French Flair background stamp, in a second generation of Stazon Stone Gray. The verse is popped up on a dark gray panel topped with a light gray panel with the verse. I tied a wide satin gray Offray ribbon in a bow positioned to the right and lastly added the antique brass brads, previously hoarded but quite at home here – I was saving them for a special occasion! Some time this week I’ll be sure to upload this to Splitcoaststampers to gallery where you can see the other cards. The SCS Gallery for Bible Verse Challenge – BVC08 can be seen here. Stamps: Stampendous, SU – French Flair; Paper – Bazzill, Die Cuts With A View – Wedding; Ink – Stazon Stone Gray; Ribbon – Offray Gray; Antique Gold Brads – K & Co.
BEAUTIFUL I love that bckg stamp. wish i had it. and of course the brads from K & company just add to the card. good job. So many times I think cards are such a waste of time because they never will be used or they don’t really say what I want to say. This is awesome – and what an awesome and inspring site. Already added Lori’s blog to my new blog file. You can never go wrong with God’s words. As soon as I got the pig home, I had to try it. Here’s a quick card that I made using a CuttleKid die. Layered on a green card, I used Brenda Walton design paper and a strip of Nana’s Kids backed on Pink Bazzill paper. Layered on a sentiment panel of green backed by pink and spelled out the sentiment with my clear CTMH Doodle Alpha. Have you seen them in the stores? They are so cute and I haven’t found much information on them so I decided to buy some and try them. CuttleKids dies are sized the same as Cuttlebug dies – roughly 2 x 2. The housing for these dies differ from Cuttlebug dies; the casing is not quite as sturdy, but ultimately they work the same and produce virtually the same results. The die is made from sharp metal and then encased on one side with foam and on the other side with cardstock. I think they are a bargain hunters dream because they are priced so cheaply in light of their basic materials, and there are so many designs. Admittedly the designs are for kids but I find them quite whimsical. I purchased a set of alphabets, but the little animals will probably all be coming home with me. that is too cute. what are we getting piggy with?